View moving relationship of your hands, arms and shoulders and maintain body stability while stroking a putt. NOTE: The mirror is convex and objects appear smaller. When you focus your eyes on the mirror circle and your eyes are parallel to the line, your alignment is correct and your left eye is over the ball. It is also acceptable to focus your eyes slightly below the mirror circle and parallel to the line. 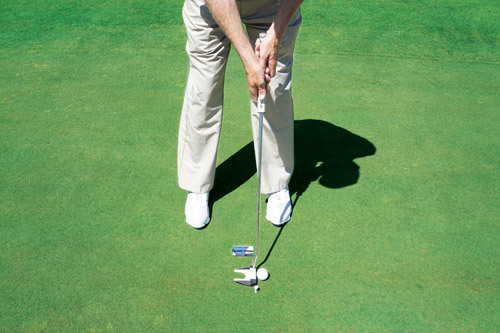 View hands, arms and shoulders while stroking a putt.